by Pindzola, Rebekah H.; Plexico, Laura W.; Haynes, William O. 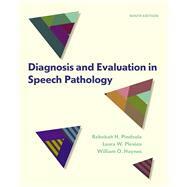 Diagnosis and Evaluation in Speech Pathology presents practical, useful assessment issues and tips on specific speech-language-swallowing disorders; provides flexible ways to assess the disorders through both standardized and non-standardized appraisal; and guides readers’ attention through a wide variety of learning tools, including new assessment materials available commercially through research publications and via social media, learning objectives and self-assessment questions for each chapter, and concluding remarks that wrap up the information covered. The material also aids the clinician with accountability to third party payors. The new Ninth Edition of Diagnosis and Evaluation in Speech Pathology has been updated throughout and includes a new chapter on adult dysphagia and pediatric feeding and swallowing disorders; a new chapter on issues of head and neck cancer and alaryngeal speech rehabilitation; a revised chapter on report writing; current clinical insights into diagnosing and evaluating communications disorders, and two new Appendices, one showing how to conduct oral peripheral examinations and the other presenting standard reading passages, which can be used in various types of assessment. Rebekah H. Pindzola, Professor Emeritus, has served the clinical and academic professions in numerous capacities. At Auburn University she rose through the ranks of assistant, associate, and full professor and provided administrative leadership as Chair of the Department of Communication Disorder, Director of the AU Speech and Hearing Clinic as well as to the College of Liberal Arts as Associate Dean and Interim Dean. She has coauthored popular clinical books and intervention materials. Now in its Ninth Edition, this Diagnosis and Evaluation in Speech Pathology has been a widely adopted text in the field of speech-language pathology both in the United States and Korea. Her co-authored book, Communication Disorders in Educational and Medical Settings (2012, Jones & Bartlett Learning), also was translated internationally. Dr. Pindzola authored two clinical monographs over the years: Voice Assessment Protocol (1987, Pro-Ed) and Stuttering Intervention Program Age 3 to Grade 3 (out o print). She also ha published numerous research articles, contributed book chapters, and presented professional papers in the areas of fluency, stuttering, alaryngeal speech following cancer, and voice disorders. Over her career, she has taught undergraduate- and graduate-level courses in these areas as well as in anatomy/physiology and the neuropathologies. Dr. Pindzola received her Ph.D. in Speech and Hearing Sciences from the University of Tennessee. Dr. Laura Plexico is an Associate Professor and certified Speech-Language Pathologist who specializes in the area of fluency disorders and speech acoustics. She currently lives in auburn Alabama and teaches undergraduate and graduate courses and provides clinical services in the Department of Communication Disorders at Auburn University. She teaches courses in fluency, speech science, counseling and clinical problem solving. Dr. Plexico’s research interests include understanding the cognitive and affective consequences of stuttering, factors that influence successful stuttering management, and factors that influence the acoustic assessment of the voice. She has received NIH grant funding, published in the area of fluency and voice disorders and has presented at regional, national and international meetings. Dr. Plexico serves as an external reviewer of manuscripts for professional journals and is actively involved in professional organizations. William O. Haynes, Ph.D., earned his Bachelor’s and Master’s degrees from Northern Michigan University in Speech-Language Pathology and completed his doctoral degree in communication disorders at Bowing Green State University. Dr. Haynes taught at Auburn University (AL) in the Department of Communication Disorders for 33 years serving two terms as department chairperson. His areas of expertise are child/adolescent language development and disorders, diagnosis of communication disorders and research methods. He has been involved with the text, Diagnosis and Evaluation in Speech Pathology since its second edition in 1973 and has incorporated significant changes seen in the field of communication disorders in each edition since that tie. He has published several other major textbooks including Communication Disorders in Medical and Educational Settings: An Introduction for Speech-Language Pathologists, Teachers and Health Professionals (Haynes, W.O., Moran, J.J. and Pindzola, R. H., Jones and Bartlett, 2012), Professional Communication in Speech-Language Pathology: How to Write, Talk and Act Like a Clinician (Burrus, A.E. and Haynes, W.O., Plural Publications, 2009), Understanding Research and Evidence-Based Practice in Communication Disorders (Haynes, W.O. and Johnson, C., Allyn & Bacon, 2009), Communication Disorders in the Classroom (Haynes, W.O. Moran, M.J., and Pindzla, R.H., 4/e, Jones and Bartlett, 2006) and Communication Development: Foundations, Processes and Clinical Applications (Haynes, W.O. and Shulman, B.B., 2/e, Williams and Wilkins, 1998). He has also published over 50 research articles in national and international journals. Dr. Haynes holds the rank of Professor Emeritus at Auburn University.